Mrs. Medie Glover Rowe, age 94, of Mayfield passed away on Monday, December 24, 2018 at Mills Health & Rehab in Mayfield, KY.
She was a member of Mayfield Church of God and a homemaker. 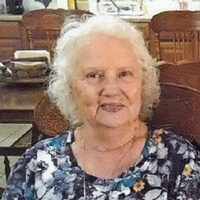 Mrs. Rowe is survived by three sons, Alfred Glover of St. Charles, IL, Robert Glover of Mayfield, KY and Michael (Brenda) Glover of Belvidere, IL; two daughters, Jacqueline Walker and Karen Campbell both of Mayfield, KY; one sister, Betty Neil of Kenton, TN; twenty-two grandchildren; forty great grandchildren; and three great-great grandchildren. She was preceded in death by her husband, Lewis Rowe; three sons, James Glover, Arthur Glover and Thomas Glover; two brothers, A. C. Gearin and James Gearin; three sisters, Madie Taylor, Lucille Gearin and Lola Marie Young; and her parents, Alfred and Callie Hopper Gearin. Graveside services for Mrs. Medie Glover Rowe will be 2:00 p.m. on Friday, December 28, 2018 at Mayfield Memory Gardens. Rev. Ronnie Stinson, Sr. will officiate. Interment will follow. Visitation will be 11:00 a.m. – 1:30 p.m. on Friday, December 28, 2018 at Byrn Funeral Home in Mayfield, KY.